By now, it’s well-accepted that a comprehensive, up-to-date compensation plan is a must for successful business. A tight talent market means organizations are focusing more than ever on strategies to retain and hire top employees, compensation being a big one. Unfortunately, putting together a strong compensation plan is no easy task. It requires in-depth thought, cross-team collaboration and real effort. Not to worry; this ebook is here to help. 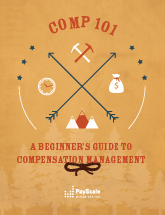 Inside, you’ll find all the info you need — including both the fundamentals as well as a step-by-step action plan — to build a solid compensation plan, and manage compensation successfully.